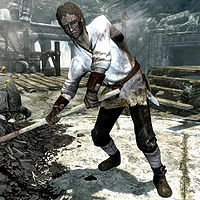 Omluag is a Breton citizen who lives in The Warrens and works at the Smelter in Markarth. He shares his room in the Warrens with Hathrasil, a co-worker at the Smelter. If you offer to talk to his boss about his working conditions, he will reward you with gold. He will also become a potential candidate for marriage. He wakes at 7am and heads to work, carrying a bucket for two hours at 7am, 11am, and 3pm. His workday ends at 7pm, then he has a four-hour dinner at Silver-Blood Inn. At 11pm, he goes back to the Warrens and wanders around there until midnight, when he sleeps. Omluag wears a set of miner's clothes along with a pair of gloves and boots. His inventory includes the key to his room in The Warrens and some poor items. In combat, he relies on an iron dagger. He is quite nervous of his boss and he will often say, "Can't talk. Mulush will beat me if I stop working. ", "I spill just a bit of metal, and Mulush takes it out of my hide. ", or "Can't you see I'm working? Beat it." if you speak to him. If you meet him at Silver-Blood Inn, he'll tell you, "Drinks here are watered down, but they're cheap." If No One Escapes Cidhna Mine has been completed, he'll comment on your escape, saying either "I saw you. With the Forsworn. By the old gods, that was something." or "I'll be damned. Someone who actually escaped Cidhna Mine. You're the talk of the Warrens." If you ask about his boss he will tell you that "He's a damn tyrant. Always being goaded on by the Silver-Bloods to get more work out of us. They pay us next to nothing. We get beaten if we make a mistake, and where are our kind Nord rulers? What are they doing? Typical." If you offer to help he will be surprised: "You're going to try to talk sense into that Orc? I'll believe it when I see it." Only saying that you're sorry to hear that will have him tell you, "Sorries don't help anyone." After you have taken care of his little problem he will be overjoyed and remark, "I don't believe it. Someone sticking up for us. Here. It's a week's wages for me, but you've earned every coin." He'll give you some leveled gold. Asking him to tell you about the Forsworn will be replied with "We've lost a lot of good people to that damn crusade. Drive out the Nords, they say. Well, the Nord ain't driven out." During The Forsworn Conspiracy, you will be asked to investigate the murder that happened in the marketplace. You can ask Omluag about Weylin, the killer. He'll reply, "The Forsworn? That's right. I'll say it. We all knew. Even that fat-headed, slave-driving Mulush knew. Just ask him about it. Bah. Another honest man lost in all this madness. And for what?" While he is working, you can also inquire about who else works in the smelter, but only if Mulush, Hathrasil, Degaine, Eltrys, and Cairine are not dead. He'll answer, "Me and Hathrasil mostly. Mulush barks at us all day, but I wouldn't call that honest work." He'll continue by saying, "A few people in the Warrens used to work here. Degaine broke some bones a while back. Eltrys quit. Cairine is too sick." Omluag: ""Mmmhmm"? I've been working with you for over 10 years, and all you have to say is "mmmhmm"?" This page was last modified on 6 August 2017, at 12:00.